The 11th Century Cathedral in Sienna, Italy was built at a time when beliefs in ancient myths of sybils and prophetesses were mingling with Christian beliefs. The marble floor of the church is carved with these feminine figures, each inscribed with prophetic words proclaiming not myth, but the coming of Christ.In a time when many were illiterate, these arresting figures presented a lesson to those with eyes to see and open hearts. Today as the pilgrim moves through the entrance of the great church, these images guide our feet, until approaching the nave and altar, the images hovering all around become clearly Christian saints and angels. And thus, the Feminine Wisdom archetype provides this artist inspiration! An ancient Black Madonna statue in the Benedictine Monastery of Montserrat, Spain is said to have perhaps been brought back from Egypt by the Crusaders many centuries ago. As one soldier named Ignatius lay gravely ill in this monastery, Mary visited him. His followers since have become known as the Jesuits, the Society of Jesus. Recognized as the first apostle, the first to greet the risen Christ, to announce him to those gathered, waiting, is Mary Magdalene.A woman of wisdom, she had long sat at his feet and deeply understood his divine message. Her open heart simply received the Spirit-filled Christ and rejoiced in what others accepted more slowly through mists of confusion. This queen is a summer--into--fall archetype carrying the energy of hot, sunny days, full golden harvests, fruit-laden vineyards ---ripeness... and... the wild, fieriness of summer is tempered by the first wind whose cold kiss paints the leaves red, gold, brown. New awareness of the turning of the season arises. What has been nurtured is now cut down. The heart knows death and cold approach. This painting is dedicated to my dear friend, Barb Gittus, who gave me the lovely golden angel pin you see here. She was greeted, I’m sure, at Heaven’s Gate by the Queen of Angels.She was a woman of faith, humor, optimism generosity and great spirit. One of the most memorable Thanksgivings of my life, I spent with her in the City of the Angels. May she be safe in the arms of the Holy Mother. Some of us have been conscious seekers as far back as we can remember. 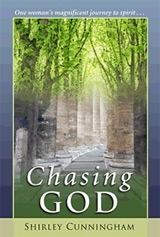 (I even wrote a book: Chasing God, which told the story---as far as it and inspiration went.) Today’s collage carries the words, “Carpe Diem.” When I was 35, I wrote the poem you see below. I knew then, as I know now, that what we seek is ‘Beyond’ and that paradoxically, we must seize the day, too. The card also carries an image of a young woman. Whatever that is that seeks always seems young, vibrant and entranced. Perhaps her gaze is drawn to the retablo draped with a rosary and honored with a candle. The retablo carries something of simplicity about what is sought. We can’t ‘think’ our way to the Source, we can only approach in simplicity, devotion and gratitude. The bottom of the card portrays a rigorous climb up the mountain. We each have our ‘Seven Story Mountain’ (Thomas Merton). The journey demands trust---a necessity, not an indulgence! Hang on to the guide rope, whatever you do. Do you think you have an inner artist? When you consider images from all the cultures of the world and all time periods, you may conclude that the inner artist is simply part of our inborn human spirit. Carl Jung thought so and called these energies within ‘archetypes.’ One can consider one’s life a work of art...take time to listen inside today and see what may want to be created in your life! In the power of imagination, images easily and quickly can pour out into words. Just as an artist can’t fully ‘explain’ a painting, so too is the poet often confounded by her own words. Images and words, mysterious and evocative, somehow carry truth already deeply known in heart and soul. Rilke said, ‘In the old woman, there is a great remembering...’Mother’s day seems made for remembering. My son Kelly, as a small boy, loved his pets, dogs and cats. After parenting all those animals, he now does a great job with three children of his own. Billie, the last cat from Kelly’s childhood, was a real lover, like a warm protective ‘mamma.’ Read on to see how he came to be immortalized in Cat Dancer. One year, I asked my life-long friend Judy what she’d like for a birthday present. I’d been painting, which she knew, and she had a love for Arizona. So it didn’t surprise me when she said, “Paint me a mountain lion.”Only thing was, I’d never painted an animal before.